2014 is the year of redesign for the Hyundai Elantra with a new facelift and upgraded powertrain making the car more appealing than ever before. With the use of Hyundai’s Fluidic Sculpture design language, the 2014 Elantra shakes off the typical conventional styling of sedans to put forth a much more forward silhouette. Wraparound headlights and natural contours create an aerodynamic, energy-efficient body that amps up the aesthetic appeal. A 1.8-liter four-cylinder engine comes standard in the Elantra sedan, getting 148 horsepower and 131 lb-ft of torque, giving the car a bit of a peppy ride. If you’re looking for more pep, the 173 hp 2.0-liter engine of the new Elantra Sport adds more rev than ever before. An EPA-estimated 38 mpg highway fuel economy takes you farther on less fuel, making sure you’re more focused on enjoying the ride than getting to the pump on time. The 2014 Elantra has more front leg room than both the Honda Civic and the Toyota Corolla, allowing this compact design to be on the same page in terms of size as many mid-size sedans. Redesigned and relocated center console controls give everyone the power to change the heating, ventilation, and air conditioning. The Elantra’s seats are even built with the environment in mind with soy-based foam to reduce the vehicle’s impact on the environment. 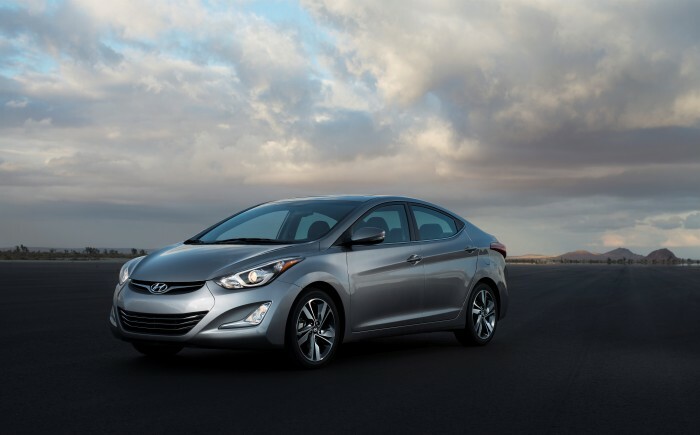 The 2014 Elantra is packed with features to help keep its passengers safe. An added driver’s blind spot mirror and other active safety features, such as standard anti-lock braking systems and Electric Stability Control, make the Elantra a top-rated vehicle for safety. Five Star Hyundai of Macon Welcome to Five Star Hyundai of Macon, Georgia! We are family-owned and proudly serve Macon, Warner Robins, Columbus, Albany, Milledgeville, and Atlanta GA. Driving Georgia home for more than 35 years, we offer a large selection of new Hyundais and used cars, trucks and SUVs for every budget.